A change for a major search engine that ensnared three of the titans of social media generated an intense discussion on blogs last week, as bloggers debated such fundamental online issues as privacy, monopolies and the access to information. On January 10, Google announced the introduction of Search plus Your World which provides personal results to those using Google Search in addition to the standard search results. Thus, if you search “pancake” you get the standard search result of photos and recipes for pancakes, but also photos that you may have uploaded to your own albums of pancakes, blog posts shared by your Google+ friends about pancakes-and photos of a friend’s dog named Pancake. What’s not a part of the new personal search results are posts on the Twitter and Facebook platforms. Instead, the results come from Google’s newer and as of yet less popular social network, Google+, its photo sharing site Picasa and its blogging tool, Blogger as well. Google and Twitter were at odds over what lay behind the absence of these posts. Twitter’s general council, Alex Macgillivray called it a “Bad day for the Internet” and the company released a statement saying they were not pleased about their exclusion. Google issued a response noting that it was Twitter that “chose not to renew their agreement [to include their updates in search results] with us.” Google’s executive chairman Eric Schmidt added that Google+ content is not being favored over Twitter and Facebook by the search engine, and if Twitter or Facebook give permission to access their content, it will be included. While Facebook has yet to make a statement on the Search plus Your World controversy, it is the most popular of the social networks with over 800 million active users (defined by the company as those who have logged in at least once a month.) Twitter executives, by comparison, said as of September 2011 they had 100 million active users, half of which tweet daily, according to PC Mag. Google+ reported 62 million users at the end of 2011. One blogger declared the dustup the “first real Internet cat fight of 2012” and discussion about the changes to Google Search made Google the No. 1 topic on blogs for the week of January 9-13, according to the New Media Index from the Pew Research Center’s Project for Excellence in Journalism. Bloggers debated everything from privacy issues to monopoly concerns to other potential far-reaching implications that the new search tool brought to light. “Both sides are being disingenuous, and the real issue is about control over social content – and users of both services are the ones who wind up losing in the end,” said Mathew Ingram of Gigaom. “[Y]ou don’t have to get into legal issues to see why Google’s new product as it appears now takes the company into dangerous territory,” wrote Steven Levy, a senior writer at Wired. 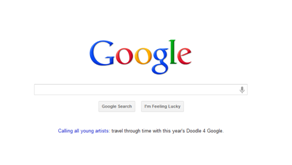 Overall, bloggers did not see the upside for internet users in Google’s move. A few bloggers were fans of Search plus Your World. The No. 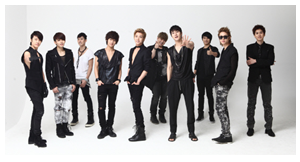 1 story on Twitter this week was Super Junior, the Korean boy band. The 10-person singing group-ranging in age from 24 to 28- has reached the top of the charts in several countries, including Japan, Taiwan and the Philippines and is extremely popular on Twitter, with fans hungry for the latest news. 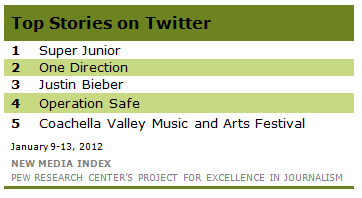 In the past month, Super Junior has been one of the top Twitter topics in three out of four weeks and was the No. 1 story on Twitter once before, the week of December 26-30. In addition, one member of the group, Siwon Choi, who tweets in English, was the No. 2 story the week of December 19-23. The group, formed in 2005, had 13 members at its peak and once claimed to be the world’s largest boy band. Over time, several members have left the group to enlist into the South Korean military. Super Junior has released over 20 records and has been divided into smaller groups (with names like Super Junior-Happy, Super Junior-M and Super Junior-T), targeting different audiences. This week, the excitement about Super Junior concerned photographs tweeted by members of the group-as well as some who left the group for mandatory military service. Kim HeeChul, who left the group for the South Korean military, tweeted a photograph of himself with the caption “happy new years.” Other members of the group shared photos of themselves and words of thanks to their fans. Siwon Choi shared an image taken while traveling in Japan. Tweeters voiced their love for the group, especially surrounding Super Junior winning four awards at the Golden Disk Award show in Osaka, Japan on January 11. “4 awards ;A; SUPER JUNIOR YOU ARE THE BEST <3 twitpic.com/85yyxs,” wrote Rai, including a photograph of the group with its awards. “The record says it all. Super Junior the last man standing! Congratulations to the boys! ^^” wrote Minnie. “Super Junior has received Popular Award thrice in a row^^ Congrats Super Junior. Let’s make it ten times in a row in the future <3” said StayTrueToSuJu. 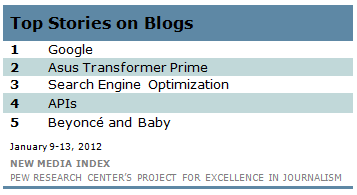 Tech stories made up the majority of top blog subjects last week. The No. 2 story was about the popular tablet, Asus Transformer Prime. Ubergizmo’s positive review of the device published in November continues to be widely shared over blogs. The tablet looks a lot like an iPad and is being sued for trademark infringement (but not by Apple). Only a month after the device’s initial release, Asus introduced an updated version of the tablet, the Asus Eee Pad Transformer Prime. In third place on blogs was discussion about how to optimize search engine results for a website. Tips included blogging constantly and making use of social media channels the same way one would main websites. The No. 4 story was a piece from Programmable Web announcing it added 46 Application Programming Interfaces-or web-based tools-to its web services directory. Services included AwardWallet, which lets users manage their airline reward balances and travel itineraries and iHelpDesk, a cloud-based customer service platform that lets organizations track service issues, manage email and other customer service tasks. Wrapping up the top-five news stories was news that the singer Beyoncé had a baby with her husband, rapper Jay-Z. The new father also released a song about his daughter, named Blue Ivy, whose crying is heard on the track. Super Junior was not the only group of musicians with Justin Bieber haircuts registering on the New Media Index this week. In second place was the British-Irish boy band One Direction. The group was among the top stories on Twitter three times since the beginning of December. Last week, Twitter was abuzz over a photo of one of the members of the group asleep with a sandwich in his mouth along with a video of the group thanking their fans after finding out they were nominated for a Brit Award. At No. 3 was the man himself, Justin Bieber, who shared two videos of his “swagger coach” Ryan Good. One was of Good making a scene at a fast food restaurant and the other was of Good and actress Ashley Benson lip syncing to a Carly Rae Jespen song. Jepson was a c ontestant on Canadian Idol. In fourth place was information from OperationSAFE, an organization that seeks to help children recover from traumatic experiences. The organization’s founder, Jonathan Wilson shared stories related to OperationSAFE’s mission, including one about the suicide rate in Japan falling in 2011 and another about how the organization helps children through art, song, games, playing and other ways. Much of the tweets mentioning OperationSAFE shared links to an application to become a disaster relief volunteer in Japan. And the fifth most-Tweeted news story for the week was the lineup for the 2012 Coachella Valley Music and Arts Festival, a popular days-long event that will be headed by The Black Keys, Radiohead, Dr. Dre, and Snoop Dogg this year. A cruise ship tragedy was one of the most-viewed news videos on YouTube last week when the Costa Concordia ran aground the night of Friday, January 13, just hours into a Mediterranean cruise. The luxury cruise liner, carrying more than 4,200 passengers and crew members, had its hull ripped open when it hit a reef off Italy’s Giglio Island and began taking on water after the ship’s captain, Francesco Schettino, made an unauthorized deviation from the programmed course. At least 11 people died and 28 remain missing. The No. 3 news video, from Russia Today, showed the Costa Concordia lying on its side with a 160-foot gash in its hull. The No. 5 video, also from Russia Today, was an amateur video showing the dramatic evacuation of passengers on lifeboats to the Tuscan shore.